HAVANA – Donated medications can’t be given to the state, my host mother Lesbia explains to me as I pry for anecdotes about her experiences with health care for a potential story. I am walking the fine line between acting as a journalist and a house guest, but it is paramount to get to the bottom of medical resource accessibility after months of research and listening to doctors vaguely talk about the lack of resources. Lesbia is telling me about her son-in-law, Jorge, who had an accident about a decade ago. He was on the roof when he fell into a power line and suffered a severe electric shock. He suffered no permanent brain damage, but one of Jorge’s legs never fully recovered. Now, he takes vitamins sent to him by doctors in the United States to ease the pain. While Jorge is lucky enough to have access to important medical procedures, these supplements make the difference between a life with lingering pain and one without it. Yet access is so limited for these things that we, as Americans, see as simple conveniences. This seems to be the Cuban reality: Where some resources are limited, people make do. “No es lo que quiera, es lo que hay, ” Lesbia said. In Cuba, it’s not what you want, it what’s there is. 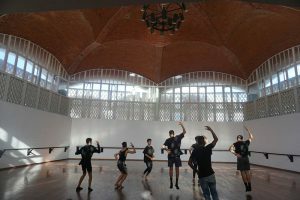 HAVANA – Fragments of light highlight the breezy open space where a teacher at the National Art School in Cuba leads a group of 17-year-old dance students in choreographed motions. The students, all boys, are dressed in black, set apart by distinctive haircuts and easy-to-read body language. The boys practice the beginning sequence to a dance with music from the countryside. Gentle guitar riffs are accented with the sound of a hand drum. The teacher demonstrates his vision for the students: Old-style music contrasted with a modern style of dance seen on the streets. “It’s his interpretation of the old and the new,” Dany, a former teacher, tells me, explaining that this dance carries historical significance in cultural gatherings where men call to women as potential dance partners. The students are in their second year of art school and dance class is a requirement for the degree. They attend school for free, as do all Cubans. It is a perk of the socialist government. I tell Dany that I’m impressed by the ratio of boys to girls in the dance class, as it appears to be about even, whereas in the United States, most dance classes draw more female interest. “In Cuba we have machismo culture,” explains Dany, “but dance here is very masculine.” He is referring to a Latin American stereotype that men parade an exaggerated sense of masculinity. I realize that I’m in a space where some of my own cultural norms cease to prevail, because exaggerated masculinity looks a lot different in the States. I find myself coming back to this notion the next day as I watch a group of men greet each other outside a Cuban market with a kiss on each cheek and a warm embrace. In the United States, a greeting like this is more often a head nod with maybe an overstated handshake at a distance of half an arm’s length. Back in the dance studio, the students laugh with each other while practicing the routine. The boys in this class will have to pay back their free education with one year of military duty and another year of social service. They evoke a sense of ease and charm, socializing while also managing to pick up on the advanced dance moves. It’s as if they are they are free to move, at least for now. HAVANA – As we walk through the Museum of the Revolution, where Cuba’s one-party government celebrates its continuing struggle against tyrannical forces real and imagined, we pass a sculpture with three figurines, the heroic triumvirate of Fidel Castro, Che Guevara and Camilo Cienfuegos. They stand as if charging ahead, wind in their hair and a sense of purpose in their chiseled frames. Some of us wander off to take pictures of the imposing former presidential palace that houses the museum. But the guide gathers us here, and invites us to pay attention to this carving. At Castro’s direction, the Cuban government passed a law shortly after his death in 2016, that prohibited the creation of images or representations of him. Raul Castro, who became president in 2008, told the nation of his brother’s wishes. As she speaks, it occurs to me that this was Fidel’s act of ultimate sacrifice. A man who all but single-handedly shaped Cuba’s life for decades, whose face still stares from billboards, and whose trademark beard is still mimicked by 22-year-olds with skinny faces, makes clear that Cuba is bigger than him and the power of his last name. Later that evening, a colleague and I meet Luis Manuel and Yanelys Leyva, an artist couple working with Cuban artists and writers to create collaborative spaces of free expression. The young couple meets us in a chic café and bar, where you can choose to sit in a low-ceilinged top floor area reminiscent of an attic, a breezy patio, or an underground space with the feel of a tavern. Luis Manuel, tall and broad-framed, leads the way downstairs. But when the idea first occurred to them in January, they had to get the explicit permission of the Cuban government before they could put up the show. And just like that, a hero’s sacrifice in the tour guide’s world, plays out as state censorship in Leyva’s and Manuel’s. COJIMAR, Cuba – In this fishing town 20 minutes east of central Havana, a cement-selling business sits on a residential street. Its warehouse is bordered on both sides by large, fenced-in lots. Workers in undershirts and rubber boots bustle, shoveling piles of powdery dry cement into cloth bags that once held food imported from Canada. The warehouse wall is painted with a fresh mural. The tall letters read, “Until victory always!” beside a painting of the likeness of Camilo Cienfuegos, who fought with Fidel Castro and Che Guevara in the revolution that carried them to power in 1959. Men and women shelter in the shade across the street, leaning on a fence or sitting on the curb, awaiting their turns to buy. It might take an hour of waiting to be called to the main gate to make the purchase, but there are no sharp words or impatient grumbles. Some of the waiting men are hoping to haul cement home for a buyer. They’ll transport it up, down and around Cojimar’s hilly streets on dusty three-wheeled bicycles hooked up to mini flatbed wagons, which are parked along the sidewalk. A tan, muscled man sitting low on the curb says he delivers cement all day. If this store runs out, he’ll go to a different one. When he hears that in the United States, the contractor delivers the building materials for the client, he smiles and tilts his head. You just make a phone call and the cement arrives, he surmises. His eyes say, imagine that. HAVANA – Spending the last night in an outdoor salsa club was the most fun cultural experience I had in Havana. The weather by the sea was warm and beautiful, with a nice breeze. The music was loud and enthusiastic. People were enjoying their time drinking and dancing salsa and bachata. What I immediately noticed is that social interactions in Havana are very open and simple without the concept of personal space. Cubans are very touch-oriented and not afraid of showing it. Dancing with strangers was what most people were doing, a man approached and asked me to dance to with him and even though I barely know basics in salsa, he was willing to teach me because dancing is meant for a good time, in keeping with the musical rhythm. After a long, memorable night of dancing and deep conversations, my friends and I sat at the ledge of the Malecón and watched the bright stars as we breathed in the light breeze and the smell of the ocean. HAVANA – As a visitor in Cuba, you’re likely to observe the frequent use of gestures and it’s important to get used to a greeting that typically goes further than the basic, “Hello.” Whether they’re talking about baseball, playing dominos or simply crossing the street, Cubans do not walk by without acknowledging the people around them. “Cubans are loud and use a lot of gestures,” says Raiko Valdes, 31, who lives in East Havana. A Cuban greeting is usually accompanied by a smile, used as a common gesture to say hello to fellow Cubans and visitors alike. It represents an acknowledgement of their fellow human beings, marked by taking the time to stop what they’re doing, even for an instant. But it’s not touchy in a violating way. It’s a touch on the arm or kiss on the cheek, a gesture that signifies an invitation to conversation. Such a contrast to urban areas in the States, where people often can’t be bothered to look up from their phones or take out their earbuds in the hustle and bustle of their daily commutes.